This cozy, yet spacious Silverthorne home is just what you need for a fun and relaxing mountain vacation any time of year. 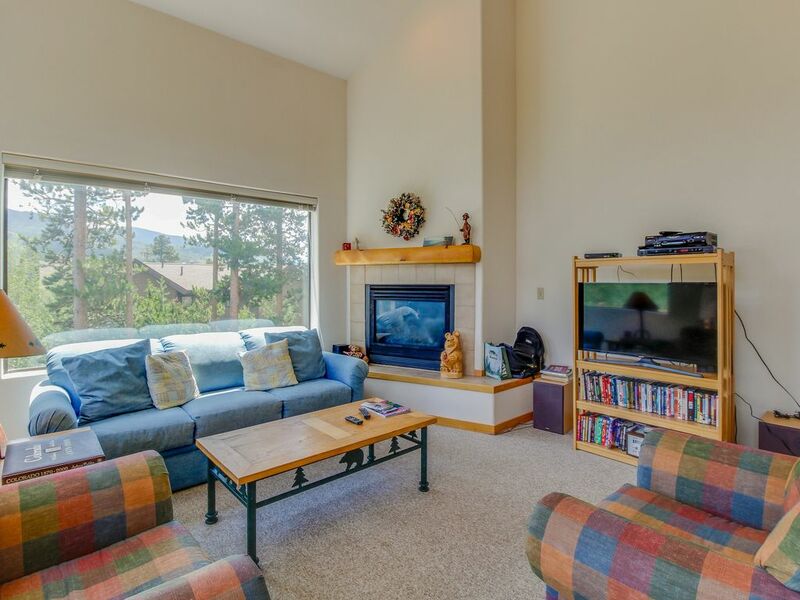 Perfect for large families and groups, this home offers lovely mountain and lake views, an on-site golf course, close proximity to the slopes, and more. Located in the peaceful Raven Golf Course neighborhood, this family-friendly home puts you about a mile from the greens. You'll also be centrally located to six major ski resorts: Keystone, Arapahoe Basin, Copper Mountain, Breckenridge, Loveland, Vail, and Beaver Creek. And you'll have easy access to dining and shopping, as well. Inside, this home boasts a cozy, yet open living area with lots of big windows and high-end fixtures throughout. The colorful sofas invite you to sit, get comfortable, and relax. Start a fire in the gas fireplace, then make a selection from the DVD/VHS library or stream Netflix and enjoy a movie on the large flatscreen cable TV. Locate the nearest market or grocery store with the free WiFi, then go shopping for the ingredients for your next feast. Cook it up in the bright and open kitchen, which features standard appliances, including a dishwasher, making your job enjoyable and easy. Dine together at the large table for six, and use the two stools at the breakfast bar for overflow. In the summer, create a barbecue masterpiece out on the deck with the gas grill, then savor it with your guests while you enjoy views of Keystone, the mountains, and the lake. Your group of up to 10 (eight adults) will be nicely accommodated in this three-bedroom, two-and-a-half bathroom home. The master suite, which fills the entire upstairs, has a queen-size bed and attached bath with a shower and double sinks. The other two bedrooms are on the lower level: one with a double and one with two twin bunks. This level also has a full Jack and Jill bathroom, and there's a sofabed in the living room. The full-sized washer and dryer will allow you to pack light and keep your clothes fresh throughout your stay. For some quiet, at-home fun, find a game from the selection for both kids and adults and settle in for the evening. During the day, perfect your swing at Raven Golf Course, just over a mile away. Family-friendly Silverthorne Rec Center is just two miles away and offers fitness equipment so you don't have to let your workout routine go while you're on vacation. And after a fulfilling day of hiking or mountain biking, take a refreshing dip in the pool, then follow that up with a soak in the hot tub or a steam in the sauna. Winter visitors will have many choices about how to spend their days. With Keystone, Arapahoe Basin, Copper Mountain, Breckenridge, Loveland, Vail, and Beaver Creek ski areas all within reasonable driving distance, you can hit a different mountain every day. Whether you're into downhill, snowboarding, cross-country skiing, or snowshoeing, satisfying snow activities are always within reach. And at the end of your day, do a little shopping in the village, then have a delicious dinner at one of Silverthorne's fine restaurants. Bring your large group to Silverthorne for the getaway you all deserve. Make this desirable vacation home yours, and enjoy a truly unforgettable Rocky Mountain experience. Make your reservation today! Parking Notes: There is parking for three cars: two in the shared driveway and one car in the garage. HOA rules: no street parking, no trailers, ATVs, camper, U-hauls, or campers allowed. The limit of three cars applies to visitors as well as guests. PLEASE do not block the neighbor's driveway. Nice to have a garage. If you haven't stayed near Silverthorne in Summer, you're missing out! This was a great place to stay. Plenty of bedrooms and space to work with, nice and open floor plan for the main kitchen/dining/living space. A few of the bedrooms are in the ground floor and the master bedroom is on the top floor - so lots of stairs, but no big deal for us. It did get a little warm at times and there's no AC, so you have to be strategic about your use of windows to create a good airflow in the space. Wonderful family spot. Roomy and open. Lots of light. A quiet location away from the craziness of a resort. You feel like you are in your own private retreat. Absolutely amazing view and easy access to shopping and ski resorts. My large family enjoyed this home! We checked out today and already are talking about our next visit.